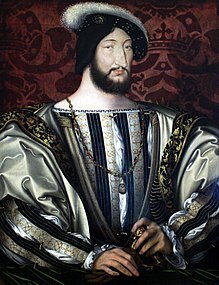 Francis I of France (September 12, 1494 - March 31, 1547) was a King of France and a member of the house of Valois. Francis was born in Cognac, France on September 12, 1494. His parents were Charles, Duke of Angoulême and Louise of Savoy. Francis was very interested in art and liked the artist Leonardo da Vinci. Francis died on March 31, 1547. He is buried in the Saint Denis Basilica. This page was last changed on 27 April 2016, at 04:03.